With the hillshade effect turned on, why does it look like there is a shattered-glass looking mess underneath the surface? It doesn't seem to correspond to the class breaks. What can I do to get rid of that without messing with cell size? I set the IDW surface's cell size to 500 so that the surface would look smoother/less pixelated, but the lower the cell size, the more pronounced the shattered-glass effect looks. It looks like the a resampling issue which is a common problem when working with raster data. As Default ArcMap uses Nearest Neighbor which can lead to your problem because when pixel values are calculated you have an acummulating shift in the recalculation and then you get those one pixel wide breaks when the shift is large enough for a full pixel that the interpolation fills in. In the following link you can try to set the options according to the point "Display resampling" where the problem is explained also a bit better then i probably did. The answer to "Why" the hillshade produces this effect is: there are discontinuous elevation differences at those cells even within a thematic color. Note that color-coding a range assigned a Hue/Saturation, but recall that checkmarking the 'Use Hillshade' applies a second HSL model based on illumination, described here. Most importantly, this shading applies based on slope and aspect...and completely disregards the theme breaks. 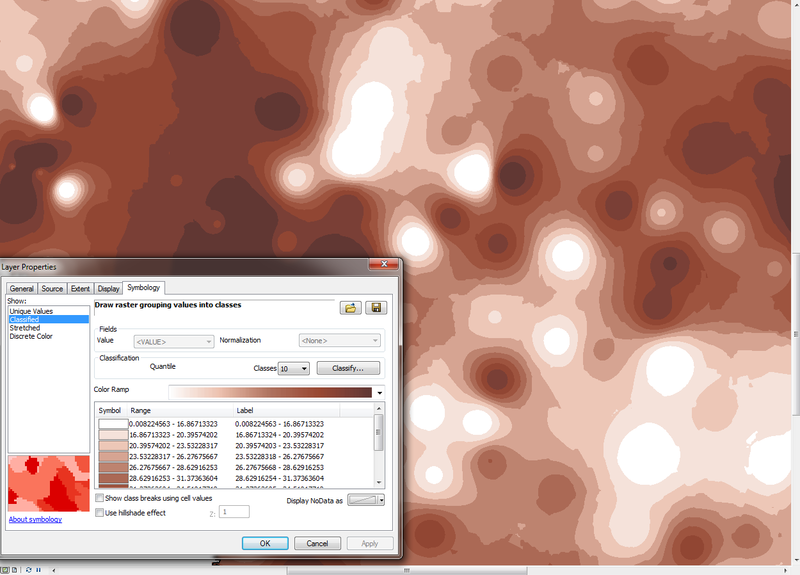 Alternatively, you can try this approach for getting a 3D look to your IDW (or other raster) data. I'll add to this answer with a suggestion for resolving your specific problem...after I try a few things. Not the answer you're looking for? Browse other questions tagged arcgis-desktop interpolation hillshade inverse-distance-weighted or ask your own question. Summing Raster cells to equal circles with specific sum using ArcMap? 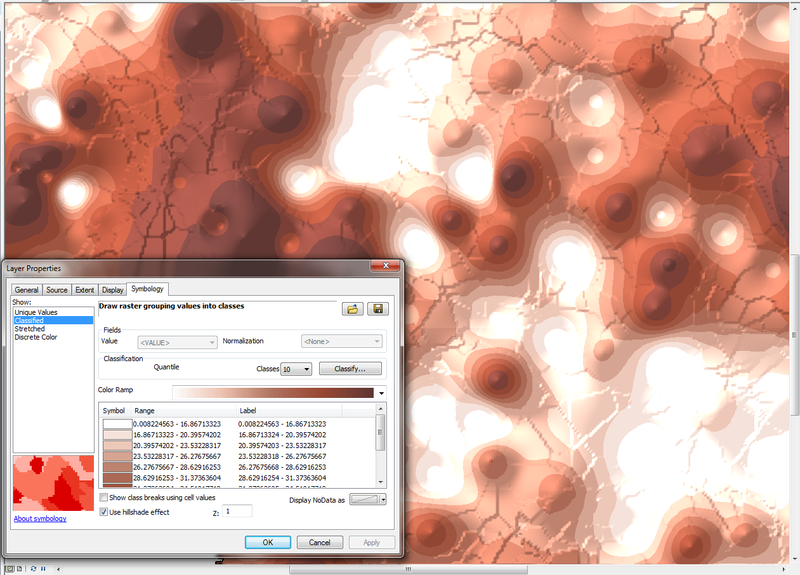 Generated ArcGIS tile cache ignores DEM hillshade effect? How can I get a blurred Hillshade effect in QGIS? Blocky Raster from TIN. How to increase resolution?